When the button represented by b1 is clicked, the function is called. Fill in the blank. When the button represented by b1 is clicked, the function doSomething is called. Fill in the blank. In a single statement convert this markup to scripted event-handling. Drag and drop to create two statements. The first assigns the field with the id "f1" to the variable fieldToCheck. The second calls the function checkIt when the user clicks in the field. When the Submit button in the form represented by f1 is clicked, the function validate is called. When the user mouses over the image represented by dog, the function swap is called. When the button represented by b1 is clicked, the function calc is called. When the user clicks out of a field represented by f1, a function with a name of your choice executes. When the user moves the mouse off an image represented by a variable of your choice, a function with a name of your choice executes. Assign an element with an id of your choice to a variable of your choice. When the user mouses over the element, run a function with a name of your choice. Time goal: 25 seconds. When the button represented by b1 is clicked, the function calc is called. Time goal: 25 seconds. When the user clicks out of a field represented by f1, a function with a name of your choice executes. Time goal: 30 seconds. When the user moves the mouse off an image represented by a variable of your choice, a function with a name of your choice executes. Time goal: 50 seconds. In a single statement convert this markup to scripted event-handling. Time goal: 40 seconds. In a single statement convert this markup to scripted event-handling. Code an event handler that calls the function when the button is clicked. Don't change any of my code. Code the event handler in the space under the <script> tag. Display the image janice-before.jpg. When the image is moused over, call the function. Don't change any of my code. Code the markup in the space above the <script> tag. Code the event handler in the space beneath the <script> tag. You did it! You've earned your certificate. 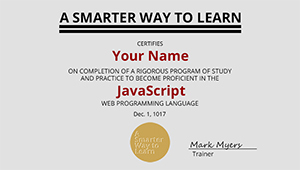 I'd like to create a permanent webpage for you, at no charge, that displays this certificate—but 4 times larger—with your name on it. I'll also give you buttons to share your certificate on social media, your website, and blog. You can also download it and print it on your printer. Order the certificate (no charge). Email me to give me a compliment, complaint, or correction.